^ 4.0 4.1 Gibbard, P.; van Kolfschoten, T. Chapter 22: The Pleistocene and Holocene Epochs (PDF). (编) Gradstein, F. M.; Ogg, James G.; Smith, A. Gilbert. A Geologic Time Scale 2004. Cambridge: Cambridge University Press. 2004. ISBN 0-521-78142-6. ^ 5.0 5.1 Davis, Owen K. Non-Marine Records: Correlatiuons withe the Marine Sequence. Introduction to Quaternary Ecology. University of Arizona. （原始内容存档于2017-07-27）. ^ Kukla, George. 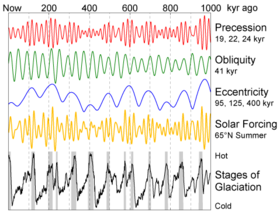 Saalian supercycle, Mindel/Riss interglacial and Milankovitch's dating. Quaternary Science Reviews. August 2005, 24 (14-15): 1573–83. doi:10.1016/j.quascirev.2004.08.023. 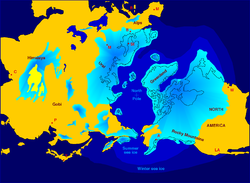 ^ Why were there Ice Ages? ^ 10.0 10.1 10.2 Why do glaciations occur? ^ Glaciers and Glaciation 互联网档案馆的存檔，存档日期2007-08-05. ^ Polish Geological Institute 互联网档案馆的存檔，存档日期2008-03-15. ^ EO Newsroom: New Images - Sand Hills, Nebraska 互联网档案馆的存檔，存档日期2007-08-02. ^ Nebraska Sand Hills 互联网档案馆的存檔，存档日期2007-12-21. 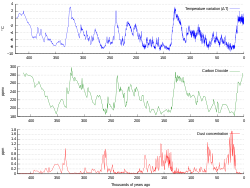 ^ When have Ice Ages occurred? 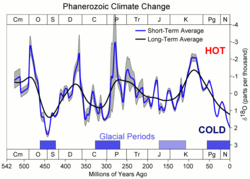 ^ 27.0 27.1 Revkin, Andrew C. When Will the Next Ice Age Begin?. The New York Times. 2003-11-03 [2008-05-07]. ^ Schlesinger, James. Climate Change: The Science Isn't Settled. The Washington Post. 2003-07-07 [2008-05-07]. ^ Tans, Pieter. 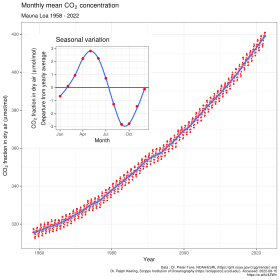 Trends in Atmospheric Carbon Dioxide – Mauna Loa. National Oceanic and Atmospheric Administration. [2012-07-30].